All types of cow's milk you're likely to find at the local supermarket are fortified with vitamin D; it doesn't occur naturally in any of them. Vitamin D and others, including vitamin A, are added to much of the milk available in the United States during processing, also known as fortifying. Some milk companies have replaced the "whole milk" label with "vitamin D milk," which may be a bit misleading. Vitamin D milk sometimes is labeled as whole milk, and there are some differences between it and 1 percent milk -- including the fat content. The amount of fat contained in different types of milk is what separates them from each other. When milk is labeled 1 percent, this means that the milk contains less than 1 percent fat, whereas whole milk, also labeled as vitamin D milk, contains 3.5 percent fat, the Dairy Council of California explains on its website. Milk is a good source of calcium, which helps build healthy and strong bones. Both 1 percent and whole milk contain calcium, but 1 percent milk contains more than other types. 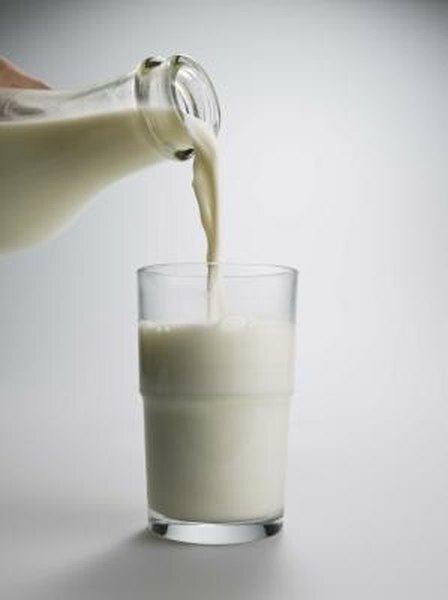 The Dairy Council of California reports that an 8-ounce serving of 1 percent milk offers 380 milligrams of calcium to 301 milligrams per serving for whole milk. With higher fat content comes more calories per serving, so it isn’t surprising that whole milk contains 156 calories in each 8-ounce glass to 127 calories for 1 percent milk. The low-fat milk also contains 2 grams more protein per serving than whole, close to 100 milligrams more potassium and 3 grams more fiber. While there are differences in fat, calories and other nutrients, the amount of vitamin D added to the various types of milk remains the same. In an 8-ounce serving of 1 percent milk, you get 25 percent of your daily recommended amount -- the identical amount in an 8-ounce serving of whole or vitamin D milk. So if you’re looking to cut calories or fat while still getting your vitamin D fix, 1 percent milk might be the best choice for you.